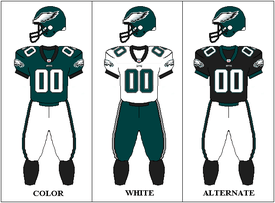 The 2002 Philadelphia Eagles season was their 70th in the National Football League. The team improved upon their previous output of eleven wins, going 12–4 and making the playoffs for the third consecutive year. The Eagles' record gave the team a tie for the best record in the NFL, and due to tie-breakers, gave them the number-one seed in the NFC, a first-round bye, and home field advantage throughout the NFC playoffs. The Eagles suffered their worst upset in franchise history at home in the 2002 NFC Championship Game by the Tampa Bay Buccaneers, who eventually won Super Bowl XXXVII The Eagles defeated the Buccaneers in the two season prior in the NFL playoffs in easy fashion. Many experts thought that the Conference Championship game would not be any different. The game is known in Philadelphia sports lore as "Black Sunday." The game was the final football game played at Veterans Stadium. The Eagles' season of high expectations began with a loss to the Tennessee Titans after the team blew a 24–10 halftime lead. The Titans scored on their first possession on 14-yard reception by Eddie George. Philadelphia took advantage of a muffed punt to extend a drive and scored on an 18-yard touchdown pass to James Thrash. The Eagles then executed a successful onsides kick and running back Duce Staley found the end zone on a 7-yard pass. Following a Tennessee field goal, the Eagles scored again early in the second quarter on an 11-play drive when Donovan McNabb completed his third touchdown pass – this one for 7 yards to Chad Lewis. A fumble recovery by the Philadelphia defense allowed a field goal before halftime to make the score 24–10 Eagles. Unfortunately, the Eagles offense and defense would go cold in the second half and the Titans would dominate the rest of the game. Joe Nedney kicked a 47-yard field goal for Tennessee, and the Eagles punted after a 15-play drive. Steve McNair completed his second touchdown pass early in the fourth quarter (the two-point conversion failed) and it was now 24–19. On Tennessee's next drive, McNair drove the Titans down the field and Eddie George punched it in from 2 yards out with 3:12 to play. The two-point conversion succeeded and Philadelphia now trailed 27–24. The Eagles' offense got two more chances, but failed to score. McNabb had two interceptions to go with his three touchdowns. Rookie Brian Westbrook, playing in his first game, led the team with 42 rushing yards on 8 carries. The Eagles crushed the Steve Spurrier-led Washington Redskins on Monday Night Football by a score of 37–7. Philadelphia found the end zone on their first two drives. Donovan McNabb scored after he was flushed from the pocket on 3rd and goal, and he hit Jeff Thomason for a short touchdown pass on the next possession. Washington's only points came early in the second quarter on a 90-yard punt return by Jacquez Green. The Eagles added three field goals before the half to open up a 23–7 lead. McNabb, despite the fact that he was late hit on the play, completed a 39-yard touchdown pass to James Thrash in the third quarter. Dorsey Levens broke a 47-yard touchdown run in the fourth quarter to make it 37–7. The Eagles outgained the Redskins 451–179, and the defense forced three turnovers. The most drama probably occurred in the fourth quarter when a strange airborne substance, which turned out to be pepper spray used by stadium security, began making players and fan cough near the Philadelphia sideline. McNabb threw for 292 yards and two touchdowns and Thrash had 107 receiving yards and a touchdown. Overcoming a slow start, the Eagles blasted the Dallas Cowboys 44–13 in their home opener. David Akers booted a 51-yard field goal early on, but Reggie Swinton returned the ensuing kickoff 100 yards for the Cowboys. Dallas took a 10–3 lead on a field goal, but the Eagles bounced back in the second quarter. Donovan McNabb hooked up with receiver James Thrash on a 35-yard touchdown and he took it in himself from two yards out four minutes later as Philadelphia moved into the lead 17–10. Akers made a short field goal before halftime to make it 20–10. In the third quarter, McNabb looked to run, but instead threw to a wide open Antonio Freeman for a 59-yard touchdown play. Then, Brian Westbrook threw a 25-yard touchdown pass to Todd Pinkston on a trick play, and the route was on. McNabb added a fourth-quarter touchdown pass to Pinkston after a 17-play drive that consumed eight minutes. McNabb threw for 287 yards and three touchdowns. The defense collected four turnovers (to give them 11 for the season at that point) and sacked Quincy Carter four times. Philadelphia overcame another slow start with another big second quarter and a big effort from safety Brian Dawkins to defeat the expansion Houston Texans 35–17. David Carr completed a 23-yard touchdown to Corey Bradford to give Houston an early 7–0 lead. Following a David Akers field goal, the Eagles took control in the second quarter behind two short rushing touchdowns by Duce Staley (with the first being set up by a Dawkins fumble recovery) and another field goal to go up 20–7 by halftime. Philadelphia then used a trick play to score its next touchdown. With a punt formation in, the direct snap went to Brian Mitchell who started to run and then flipped it past the defense to Dawkins, who raced 57 yards for the score. After the two-point conversion, the Eagles led 28–7. The Texans came back with another touchdown to Bradford and a field goal to close to 28–17, but Donovan McNabb (who signed a 12-year contract extension the week before the game) sealed the deal with a 38-yard touchdown to James Thrash. Dawkins became the first player in NFL history to record a sack, recover a fumble, intercept a pass, and catch a touchdown pass in the same game. McNabb, who had early accuracy issues, threw for 259 rds. The defense sacked Carr seven times. Another sloppy performance against an AFC South opponent meant a 28–25 defeat for the Eagles in Jacksonville. Trailing 6–0 after a pair of field goals by the Jacksonville Jaguars, Philadelphia took the lead on 4-yard touchdown pass to Chad Lewis. With less than two minutes left in the half and Jacksonville set to punt, the Eagles were flagged with too many men on the field resulting in a Jaguar first down. Mark Brunell took his team quickly down the field and fired a touchdown to Kyle Brady. The two-point conversion gave Jacksonville a 14–7 halftime lead. After a David Akers field goal, Jacksonville receiver Jimmy Smith beat Bobby Taylor and took the ball to inside the Eagle 5-yard line, leading to an easy Jacksonville touchdown. Later in the fourth quarter, Jaguar return man Bobby Shaw took a punt back for a touchdown (the third return for a touchdown against the Eagles in four weeks) to make it 28–10 and put the game out of reach. Donovan McNabb, who was sacked five times and was visibly ill in the fourth quarter, rallied the Eagles to two late touchdowns, but Philadelphia came up three points short. McNabb rushed for 100 yards and Duce Staley rushed for 82. The defending NFC East champion Eagles fell to 3–2 as they went into the bye. Duce Staley and the defense turned in great performances as the Eagles scored a big win over the Tampa Bay Buccaneers. Philadelphia scored first on a 30-yard field goal by David Akers, however the Bucs took the lead when Derrick Brooks picked up a Donovan McNabb fumble and returned it 11 yards for a touchdown six minutes into the first quarter. In the second quarter, after Brian Mitchell returned a punt into Tampa Bay territory, McNabb hit Todd Pinkston on a fly route for a 42-yard touchdown and a 10–7 lead. The Eagles and Bucs traded field goals in the third quarter as the Philadelphia defense (ranked #2 in the league behind Tampa) preserved the narrow lead. In the fourth quarter, McNabb scored on a short run himself on a long drive to give the Eagles a 20–10 lead. Staley rushed for 152 yards on 24 carries, while the defense registered four sacks and knocked Tampa quarterback Brad Johnson out of the game with cracked ribs. The win made the Eagles 4–2 with an undefeated record against opponents in their conference. After a big win over Tampa Bay, the Eagles did not let down, defeating the New York Giants at home on Monday Night Football 17–3. A 27-yard kick by David Akers gave the Eagles a 3–0 lead. Tiki Barber's 31-yard run in the second quarter set up a field goal for New York, but the Eagles answered with two more field goals to take a 9–3 lead. The Giants best chance to score was broken up when safety Blaine Bishop stripped Charles Stackhouse near the goalline, knocking the ball out of the end zone for a touchback. In the fourth quarter with the ball on Giant 40-yard line on third down, Donovan McNabb was flushed from the pocket and took off on a 40-yard scramble down the left side for a touchdown, picking up key blocks from John Welbourn and Todd Pinkston. McNabb completed the two-point conversion to Chad Lewis. McNabb rushed for 111 yards and Duce Staley picked up 126 yards. The Eagles went 5–2 and took a two-game lead in the division race. The Eagles overcame a halftime 13–7 deficit to defeat the Chicago Bears in a cold, blustery day in Champaign, Illinois. Trailing 3–0, the Eagles drove down the field aided by several Chicago penalties. A 5-yard rush by Donovan McNabb gave the Eagles the lead, but Chicago came back with a 6-yard Anthony Thomas touchdown run and a 53-yard field goal before halftime. In the second half, the Eagles defense clamped down, pressuring Bears quarterback Jim Miller and holding Chicago scoreless. David Akers booted four second half field goals to give the Eagles their winning margin, 19–13. The defense sacked Miller three times and McNabb threw for 209 yards and rushed for 46 plus a touchdown. The win made Philadelphia 6–2. Peyton Manning and the Indianapolis Colts trounced the Eagles 35–13 in their worst loss since 1999. Philadelphia scored first on a field goal, but then Manning began to pick apart the Eagles' defense, driving the Colts to two first-quarter touchdowns. The Eagles got another field goal in the second quarter to make it 14–6, but the Colts put the game away in the third quarter when Manning completed touchdown passes to Reggie Wayne and Marvin Harrison. The only Eagle touchdown would be a 2-yard touchdown pass to tight end Jeff Thomason. Manning would go 18-for-23 with 319 passing yards and three touchdowns, rookie running back James Mungro carried for 114 yards and two scores, while Harrison and Wayne each had over 100 receiving yards. McNabb was 27-for-47 with 281 yards. The Eagles fell to 1–3 against the AFC and 6–3 overall. In probably the gutsiest performance of Donovan McNabb's career, the quarterback played an entire game on a broken ankle and threw four touchdown passes to lead the Eagles past the Arizona Cardinals 38–14. On the third play from scrimmage, McNabb was sacked by LaVar Woods and Adrian Wilson, resulting in what was initially believed to be a sprained ankle. With Arizona ahead 7–0, McNabb (who was limited to either throwing quickly or handing off), took the Eagles down the field and completed a 2-yard touchdown pass to James Thrash. He found Dorsey Levens for another short touchdown in the second quarter. Jake Plummer and the Cardinals tied the game at 14–14, but McNabb hit Todd Pinkston with a 27-yard pass to give Philadelphia a lead it would not relinquish. Just before halftime, McNabb completed his fourth touchdown pass – a 9-yarder to Duce Staley. In the second half, the Eagles added a field goal and a 9-yard touchdown run by Thrash. McNabb had gone 20-for-25 for 255 yards and four scores, while Staley contributed 136 rushing yards. After the game, x-rays revealed that McNabb had actually broken his ankle. The injury would keep him out until at least the playoffs. Despite a 7–3 record, the prevailing belief was that the Eagles' Super Bowl run had been derailed with the loss of McNabb. On a Monday Night game in San Francisco, the Eagles won in an improbable 38–17 blowout over the 7–3 49ers in the team's first game without Donovan McNabb. Backup Koy Detmer led the Eagles to a touchdown early in the second quarter, completing a 25-yard touchdown pass along the sideline to Todd Pinkston for the lead. Brian Mitchell followed with a 76-yard punt return touchdown (his NFL-record 13th) to make it 14–0 Philadelphia. After the 49ers scored on a Terrell Owens touchdown reception, Detmer made it 21–7 with a touchdown strike to Antonio Freeman. Detmer dove the ball in himself in the third quarter to open up a 28–10 lead for the Eagles, but during a drive later in the quarter, Detmer dislocated his elbow and was taken from the field in obvious pain. Third-string quarterback A. J. Feeley entered the game and immediately hit Chad Lewis with a short touchdown pass for Philadelphia's fifth touchdown. Owens would catch one more touchdown, but the defense, which had four sacks, mostly held the San Francisco offense in check. Detmer had statistically the best night of his career, throwing for 227 yards and two touchdowns. Pinkston had 6 catches for 94 yards. The Eagles went to 8–3 with a 7–0 record within the NFC. A strong defensive effort helped the Eagles defeat the St. Louis Rams 10–3 in a rematch of the 2001 NFC Championship Game. Cornerback Bobby Taylor returned a Kurt Warner interception 23 yards for a touchdown. David Akers kicked a 31-yarder in the second quarter to give Philadelphia a 10–0 lead. The Rams could only muster a field goal over the entire game. The Eagles picked off two passes (including one by Troy Vincent that ended a late St. Louis scoring threat) and recovered three fumbles. N.D. Kalu had half of the team's eight sacks of Warner, and Marshall Faulk was held to 29 yards rushing. A.J. Feeley, with 181 passing yards, was efficient in his debut by avoiding any interceptions. The Eagles improved to 9–3 with the win. The Eagles won again behind third-string quarterback A.J. Feeley, downing the Seattle Seahawks 27–20. The Seahawks drove for field goals on their first two possessions to take a 6–0 lead. Brian Mitchell had a good return on the ensuing kickoff, Feeley then converted a couple of big third downs before connecting with James Thrash for a 6-yard touchdown pass. In the second quarter, Duce Staley broke a 21-yard touchdown run to make it 14–6 Eagles. Two David Akers field goals later, and the Eagles led 20–6 at halftime. Rookie Sheldon Brown picked off Matt Hasselbeck and Feeley followed with a 20-yard touchdown pass to Todd Pinkston. After Seattle narrowed the score to 27–13, Akers missed a fourth-quarter field goal that would have put the game away. Hasselbeck responded with another touchdown pass to make it 27–20, but the Eagles recovered the onside kick and ended the game. Philadelphia sacked Hasselbeck four times and intercepted him three times. Staley rushed for 100 yards, while Shaun Alexander gained 123 for Seattle. Feeley threw for 190 yards and two touchdowns, while Pinkston had 7 catches for 88 yards. The Eagles had now won a season-high four straight games and were 10–3. Playing in the final regular season game at Veterans Stadium, the Eagles clinched their second straight NFC East title after an easy 34–21 win. On Washington's first drive, rookie safety Michael Lewis recovered a Stephen Davis fumble for the Eagles. Duce Staley scored on a 38-yard catch-and-run to give Philadelphia a 7–0 lead. The Eagles added a field goal and a short Staley rushing touchdown in the second quarter to go ahead 17–0. Ahead 17–7 in the third quarter, Eagle linebacker Carlos Emmons recovered a fumble, and after not being touched by the Redskins, proceeded to return it 44 yards for a touchdown. Washington went three-and-out, and A.J. Feeley led the Eagles on an 80-yard drive capped off by a 6-yard touchdown pass to Antonio Freeman to bury the Redskins 31–7. Washington scored two "trash time" touchdowns in the fourth quarter. Feeley threw for 220 yards and two touchdowns, and Staley had 106 yards from scrimmage and a pair of scores. Philadelphia's defense forced and recovered three fumbles. The Eagles were now amazingly undefeated since the McNabb injury and were playoff-bound with an 11–3 record. Despite Koy Detmer being healthy enough to start vs Dallas, Andy Reid decided to stick with A.J. Feeley, who was having success . The Eagles brushed aside the hapless, Dave Campo-led Dallas Cowboys 27–3 at Texas Stadium. Duce Staley ran it in from 5-yards out in the first quarter and Todd Pinkston caught a 14-yard touchdown pass from A.J. Feeley in the second quarter as the Eagles went to halftime with a 17–0 lead. The Eagles defense harassed Dallas quarterback Chad Hutchinson throughout the game, sacking him seven times and holding him to 128 passing yards. A Joey Galloway punt return inside the Philadelphia 10-yard was wasted for Dallas when the Eagles defense held and forced a turnover on downs. The Cowboys got on the board with a field goal on their next drive, and were deep in Philadelphia territory on their next drive when Shawn Barber intercepted Hutchinson and returned the ball 80 yards to put the game away. David Akers added his second field goal as the Eagles went ahead 27–3. Staley and rookie Brian Westbrook combined for 111 rushing yards. Feeley had 253 passing yards, one touchdown, and two interceptions. Antonio Freeman had four catches for 82 yards. Philadelphia went to 12–3, 11–0 within the NFC. With the New York Giants playing for a wild card berth and the Eagles playing for homefield advantage throughout the playoffs, the Giants edged the Eagles 10–7 in overtime. Philadelphia moved down the field on their opening drive, scoring on a 20-yard reverse to James Thrash, but their offense would struggle throughout the rest of the game. The Giants moved the ball well, with Tiki Barber rushing for 203 yards and receiving 73 yards. However, Barber had three fumbles lost that helped keep New York off the board until the fourth quarter, when rookie tight end Jeremy Shockey took the ball away from safety Brian Dawkins in the air in the end zone. With the score tied and five minutes left, Dawkins stripped Barber (his third fumble) and the Eagles recovered at the Giant 26-yard line, but David Akers missed a 35-yard field goal and the game went to overtime. On their first possession, the Giants maneuvered into Eagle territory and Matt Bryant kicked the 36-yard game winner. The Giants outgained the Eagles 461–209 and A.J. Feeley had his worst game of the season, going 13-for-25 for 150 yards with an interception. The Eagles finished the season 12–4, and still received homefield advantage throughout the playoffs when the Green Bay Packers were defeated the next day. After enjoying a first-round bye, the Eagles opened up their playoff quest against the Atlanta Falcons. The Falcons, led by second-year quarterback Michael Vick, went 9–6–1 during the season. Though they stumbled towards the end of the season, losing three of their final four, the Falcons upset the 12–4 Green Bay Packers at Lambeau Field in the Wild Card round 27–7. For the Eagles, quarterback Donovan McNabb was back under center after missing the final six games with a broken ankle. Seven minutes into the game, on Atlanta's second possession, Vick was intercepted on the left side by cornerback Bobby Taylor, who returned the ball 39 yards for a Philadelphia touchdown. McNabb led the Eagles to field goals on their next two drives, and by the middle of the second quarter, it was 13–0 Philadelphia. The Falcons got on the board with a 13-play drive capped by a short Jay Feely field goal. After the Eagles punted, Vick took the Falcons on a 9-play drive in two minutes to set up a 52-yard Feely field goal to end the half with the score 13–6. After a 51-yard field goal miss by David Akers in the third quarter, the Falcons drove into the Philadelphia red zone. On second down, Vick took off on a dash towards the end zone. Brian Dawkins delivered a crushing hit that left both players sprawled on the turf, but Vick had reached the end zone and it appeared the game would be tied. However, a holding call negated the touchdown and two plays later, Feely missed a short field goal. In the fourth quarter, McNabb guided the Eagles down the field with a series of short passes and on 4th and 1 from the Atlanta 35-yard line, he found James Thrash over the middle and Thrash sailed untouched into the end zone for the game-sealing touchdown. Ahead 20–6, Philadelphia drained the clock on their next possession and Vick threw an interception to Dawkins to end the game. McNabb was an efficient 20-for-30 for 250 yards and a touchdown in his return. He also had a 19-yard scramble on the Eagles' first drive. The defense played a strong game, sacking Vick three times, holding Warrick Dunn to 45 yards rushing, and limiting Atlanta to just two field goals. Vick had 274 passing yards, but he threw two interceptions. The Eagles were dealt a crushing upset 27–10 defeat in the NFC Championship Game by the Tampa Bay Buccaneers. The favored Eagles appeared destined to win the conference title and propel themselves into the Super Bowl. They had beaten the Buccaneers at home in each of the last two postseasons and in October 2002, they had defeated Tampa Bay 20–10. The Buccaneers had never won a road playoff game and were 1–22 in games under 40 degrees (it would be 26 degrees at kickoff). Moreover, the game would be the final one for the Eagles at Veterans Stadium. Brian Mitchell returned the opening kickoff 70 yards for the Eagles. Two plays later, Duce Staley broke through the middle for a 20-yard touchdown in the game's first minute. The Eagles led 7–0, the Philadelphia crowd was deafening, and the Eagles now looked certain to cruise to victory. The Buccaneers recovered quickly, driving for a 48-yard Martin Gramatica field goal on their first possession. The Eagles punted on their next drive, pinning Tampa Bay at their own 4-yard line. On 3rd-and-2 from the Tampa 24-yard line, quarterback Brad Johnson hit Joe Jurevicius on a crossing route over the middle. Jurevicius badly beat veteran safety Blaine Bishop, who was playing injured, on the coverage and ran down the sideline all the way to the Eagle 5-yard line. The 71-yard play turned the tide of the game and Mike Alstott finished the drive with a touchdown to put Tampa Bay ahead 10–7. In the second quarter, Philadelphia drove into the Tampa Bay red zone and tied the game with a 30-yard David Akers field goal. However, the Buccaneers began a 12-play drive on the ensuing kickoff that ended in a 9-yard touchdown pass from Brad Johnson to Keyshawn Johnson, making it 17–10 Tampa Bay. Donovan McNabb took the Eagles back into Tampa Bay territory before halftime, but Simeon Rice sacked McNabb and recovered the resultant fumble. On the Eagles' first possession of the third quarter, McNabb lost the ball again on a sack, this time near midfield. With a minute left in the third quarter, Tampa Bay added another field goal to take a 20–10 lead. Philadelphia had trouble moving the ball throughout most of the second half as their hopes faded. With less than four minutes to play, the Eagles drove to the Tampa Bay 10-yard line, but McNabb was intercepted by Ronde Barber who returned the ball all the way for a touchdown to end the game. McNabb was 26-for-49 for 243 yards with an interception and two fumbles lost, while Johnson was an efficient 20-for-33 for 259 yards and a score. Staley was held to 58 yards rushing, while the Eagles defense did manage to hold the Buccaneers to only 49 rushing yards. The heartbreaking loss, which was made all of the more painful when Tampa Bay went on to easily defeat the Oakland Raiders in the Super Bowl two weeks later, is consistently rated as the worst in Philadelphia sports history.